Don't miss the 18th Philippine Travel Tour Expo 2011 happening on February 18-20 at the SMX Convention Halls 1-4, Mall of Asia Complex from 10AM to 9PM ('till 7PM only on the 20th). Entrance fee is Php50 for General Admission and Php20 for Senior Citizens. Conceptualized by the Philippine Travel Agencies Association (PTAA) in cooperation with the Department of Tourism (DOT), this year's expo will offer over 400 booths for us to choose from -- both Domestic and International flights and sale packages that will surely excite us! About 80,000 visitors were present in the 2010 edition which had 416 booths occupied by 230 firms. Again, the details are listed below. For more information, you can also visit their website. Spread the word, so we can all have a great year of traveling! 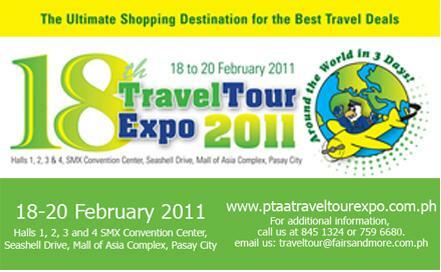 I hope I'd be able to attend the next travel expo. Thanks.